Tireless mom. Doting wife. Talented decorator to the stars. Janice Kaplan’s irresistible, one-of-a-kind sleuth Lacy Fields dials up her detecting skills in this hugely entertaining shopping-meets-suspense follow-up to Looks to Die For that Publishers Weekly called “fun and breezy.” As the curtain rises on another sunny day in Los Angeles, Lacy is still married to one of the city’s most prominent plastic surgeons and plying her decorating trade among the glitterati. But when one of her beautiful young clients, Cassie Crawford, drops dead in her freshly decorated penthouse, suspicion lands on Lacy’s own best friend Molly Archer, a hot Hollywood casting agent who’s been spending a little too much time with Cassie’s billionaire husband. Once again, Janice Kaplan proves herself a master at poking fun at the peccadilloes of the Hollywood glamour set while never letting up on the page-turning plotting. 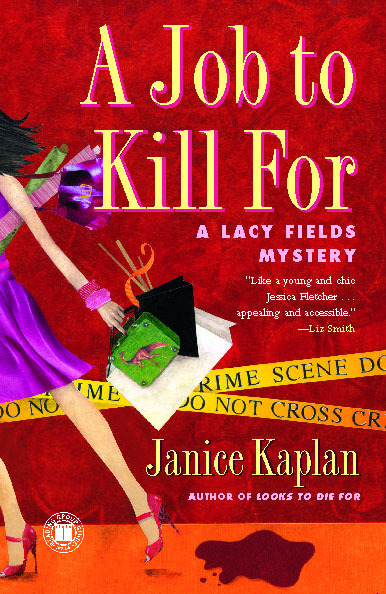 The winning combination of the author’s sassy wit and scintillating suspense make A Job to Kill For a delicious entry in the Lacy Fields series. Janice Kaplan was the editor-in-chief of Parade magazine and an award-winning television producer. She is also the bestselling coauthor of novels, including The Botox Diaries, and author of the popular Lacey Fields mysteries. She lives in New York City and Kent, Connecticut. Visit JaniceKaplan.com.